Used car dealerships in Cincinnati have many different models to choose from. But when you’re looking for a used vehicle on a budget, you want to make sure you find one that will last. Check out this list of affordable models. Not only do they have above average reliability ratings from J.D. Power, but they also have solid fuel economy ratings that will save you in the long run. This four-door car from Buick is best loved for it’s extremely roomy, comfortable cabin and unbelievable cargo space. The enormous trunk offers owners almost as much flexibility as a hatchback. Despite its pleasing size the LeSabre still gets 27 miles per gallon on the highway, keeping fuel costs reasonable for drivers with significant commutes. Powered by a 3.8-liter V6 that delivers 205 horsepower, the LeSabre is no slouch when it comes to acceleration. It has plenty of oomph to keep you entertained, even if it appears rather tame. You may even be able to find one of the limited Celebration Edition LeSabres that came out in 2003. They were produced in honor of Buick’s centennial anniversary and the LeSabre’s successful run of 10 years as the best-selling full-size car in the U.S.
Edmunds praised the 2002 Intrepid for offering huge amounts of space while still handling like a much smaller sedan. Some large sedans feel clunky when you’re behind the wheel but not this one. The Intrepid’s powerful engine and maneuverability make it a big win. Plus it manages a respectable 26 miles per gallon on the highway. Model appearances run the gamut thanks to Dodge’s three different trim offerings. The base is a stylish match for a family while the R/T offers a sportier punch. But across the board, Dodge’s Intrepid is recognized as a dependable model that lasts for many years. Owners boast high mileage with extremely minimal service outside of regular maintenance. A favorite when it comes to reliability, Toyota has long held a reputation for making some of the most dependable vehicles around. The 2001 Camry is no exception. But that’s not the only reason it’s a smart way to go if you’re buying used. It also offers a smooth, engaging ride thanks to its powerful V6 engine. And with a fuel economy rating of 30 miles per gallon on the highway, the Camry ensures that owners spend less at the pump and keep more in their wallets. Base trim models can come off as a bit bland, so look for higher end versions that have a little more flair. You can find a Camry with keyless remote entry, a moonroof, a six-disc CD changer, leather upholstery, and more. Buying this car is an excellent way to get lots of bang for your buck. You can choose between a sedan or wagon, depending on your needs, and you’ll find that both styles come with impressive features. The Taurus’ tasteful interior comes with a long list of features. And in 2003, a premium instrument cluster with a satin-finish background, Imola leather-trimmed seats, and dark wood trim were all made available. 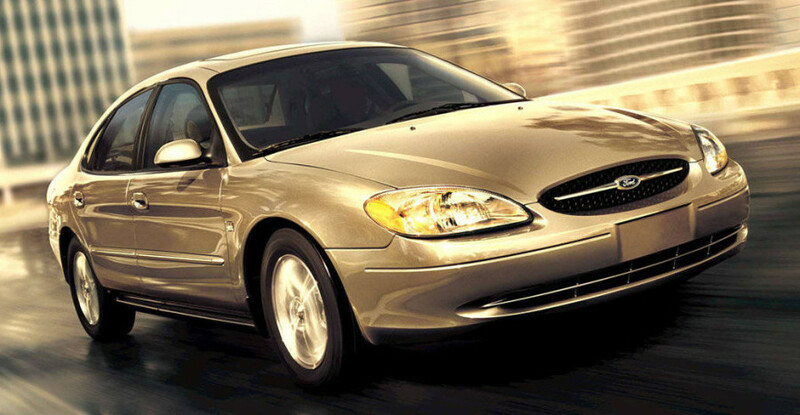 In addition to the comfort and appeal it offers, the 2003 Taurus also has noteworthy advanced safety equipment to protect you and your passengers when you’re on the road. Front headrests, ventilated front disc/rear drum brakes, and Electronic Brakeforce Distribution are all part of the package. 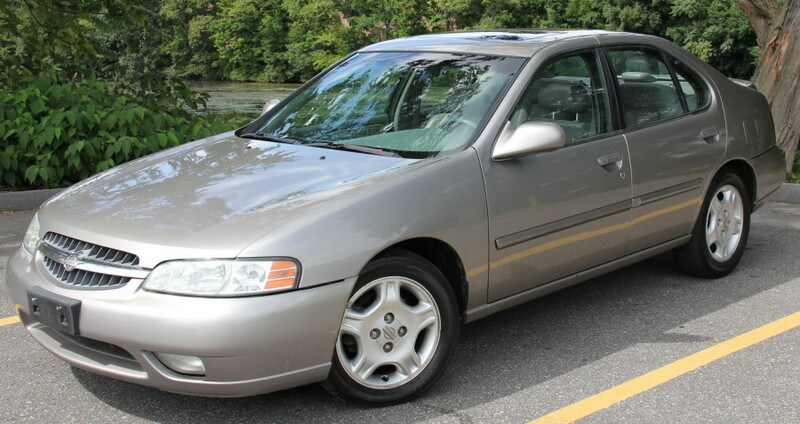 The Taurus is a great used car to consider if you’re on a budget, and it’s American made. Though it was often overlooked at the time, the Malibu offers a great little package, and it has plenty of enjoyable features. You can relax in the Malibu’s front bucket seats which got new cloth upholstery in 2001. And in the same year, an upgraded stereo system was added so you can listen to your tunes in style while you cruise. With high consumer ratings and strong reliability scores, the Malibu is a great used car to be on the lookout for. The Spectra is definitely a people pleaser. With its chic interior, peppy ride, excellent safety features, and comprehensive package, it’s a tough model to beat. Plus it has really good fuel economy for a car that’s a few years old; it gets 31 miles per gallon on the highway. And there are options for folks who like their ride with a little extra style and zing. 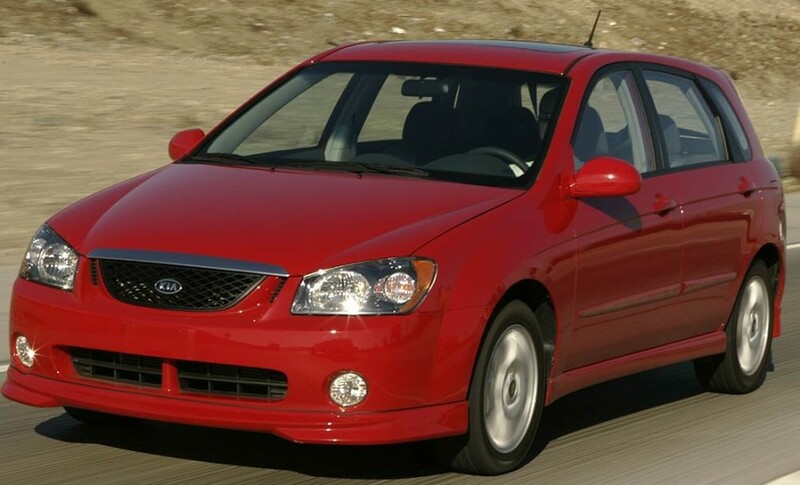 In 2005, the Spectra was offered as a 5-door hatch and Kia also added the sporty SX trim. Both came decked out with details like spoilers, black mesh grilles, leather-wrapped steering wheels and shift knobs, and metal pedals. Plus Kia threw in a sporty suspension for extra responsiveness. The Spectra is a great value car with plenty of options to choose from. Nissan’s popular Altima has been around for years, attracting buyers again and again with it’s value pricing and solid performance. With a fuel economy rating of 28 miles per gallon, the Altima helps drivers keep the costs of ownership low. If you browse through consumer reviews of this car on Kelley Blue Book, you’ll find that nearly every reviewer is highly likely to recommend the Altima. One driver, who had racked up nearly 200,000 miles in her Altima, called it the “Energizer Bunny of Cars.” With reviews that good right from the horse’s mouth, it’s easy to see why the 2001 Altima is a prime choice when you’re shopping used. Fun to drive because of its top-notch engineering, Pontiac’s Grand Prix has made a name for itself as one of the most entertaining used cars you can get your hands on. Its 3.8-liter V6 pumps out 200 horsepower, and, paired with a four-speed automatic transmission, it gets about 27 miles per gallon on the highway. Not too shabby. It also has lots of features that make it stand out. Models with the Limited Edition package have a rear spoiler, premium wheels, exclusive badging, seats with special stitching, and more. One thing to keep in mind is that ABS brakes were optional in the lower trims, so make sure any used model you look at has the proper equipment built in. Fans rave about the reliability of the Corolla; it’s another one of Toyota’s famous diehard models that seems to run forever. In addition to being seemingly immortal, the 2001 Corolla has another really awesome trick up its sleeve. It pulls off 37 miles per gallon, making it the most fuel-efficient model on the list. It’s well-built, performance is more lively than you might expect, and the 2001 benefitted from some fresh styling cues as well. This Toyota is really just an all-around win. 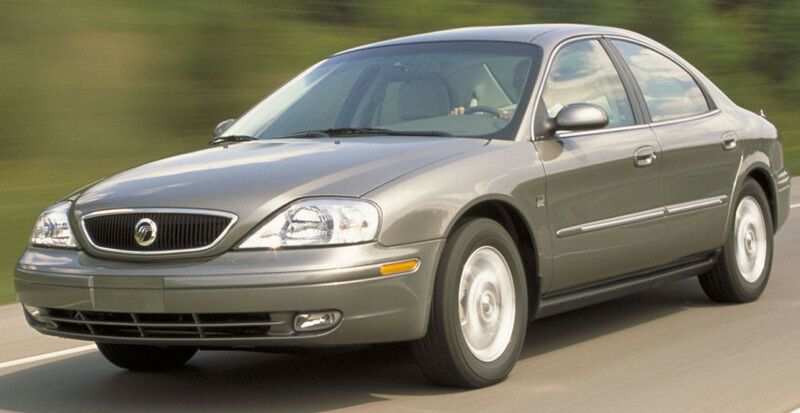 Available as a wagon or sedan, the Mercury Sable gives drivers a great luxury feel for low bucks. Its comfy plush interior will make you feel like you spent a whole lot more than you actually did. You’ll spend a little extra on gas compared to some of the other models though. This car’s fuel efficiency tops out at 25 miles per gallon which, while not terrible, isn’t really great either. It does, however, have excellent safety ratings, and it includes standard protective features like front seatbelt pretensioners, front headrests, and Electronic Brakeforce Distribution. This car’s got class, and it’s built to keep people safe, making it worth a look if you see one on the lot.